Amino acids are the backbone of peptides and proteins. All amino acids contain both amino and carboxylic acids, and in certain cases, side chains. The properties of amino acids are determined by the functional substituents linked on the side chains, which are most commonly referred to as R groups. In the amino acid chart listed here, we describe the 20 standard residues found in nature, along with the universal genetic codes. 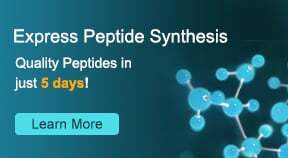 Reliable peptide service New upgrade in GenScript is ready to accelerate your research！Or you can contact peptide@genscript.com for any technical support.